Sony's latest free PSPgo game giveaway is slightly marred by the lack of consumer choice. When it was first revealed that Sony was giving away free games again with the purchase of a PSPgo, the three or four people that bought a PSPgo this month must have emanated quite a cheer. 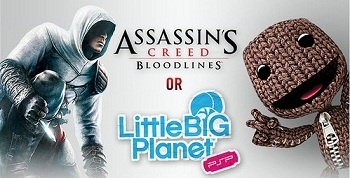 LittleBigPlanet PSP and Assassin's Creed: Bloodlines were the giveaways this time, but Joystiq has discovered that the promotion comes with age-restricting rules. New PSPgo purchasers will not be given a choice between the two games. Instead, Sony will be providing a code to download one of the two based on the age of the new PSPgo owner. If you're 17 or older, you're stuck with Assassin's Creed: Bloodlines, even if you hate action games and love platformers such as LittleBigPlanet PSP. SCEA writes: "The game sent to consumers is determined by age, once the user creates/logs into their PlayStation Network account." I get wanting to make sure that those under 17 do not get their hands on the brain-altering Assassin's Creed: Bloodlines, but not the forcing of it upon people that might want to have fun with a Sackboy instead. LittleBigPlanet PSP would probably be my choice here, as the PlayStation 3 version is the bee's knees. However, I would get totally screwed if I bought a PSPgo, because I have the unfortunate condition of being older than 17 Earth years. Well, not really totally screwed, but at the least Sony should give those 17 and older a choice between the two games, though the younger can understandably be stuck with LittleBigPlanet. While I'm not one to complain about a free game giveaway, the age restrictions put on this one might upset a few people rather than please them, because we all know how people are.